My son Antonio De La Rosa is wearing the costume. He loves the sport of baseball. 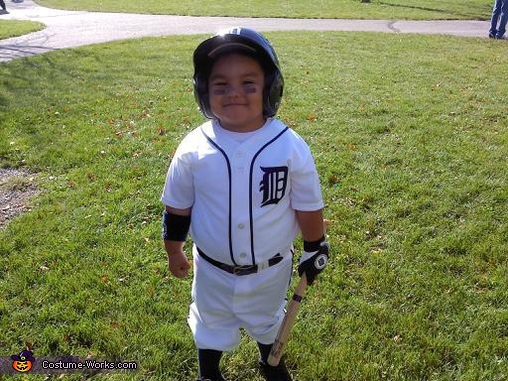 His favorite player is Miguel Cabrera from the Detroit Tigers. With my 3 year old son being as chunky as he is, it was only fitting to make him Miguel Cabrera. He loves it! It took us about 1 month to get everything for the costume. We tried to make it as authentic as we could. From the custom jersey,to the helmet decals to the turtle neck..even down to the socks. It tooks TONs of time to track down everything we needed, with countless trips to stores up to 60miles away from us. I love it! Great idea. Not original at all! Good choice on the player also. Was dominant this year, he won the batting title for the american league!